Crafting Adventures: "I've Got, High Hopes..."
This is the first time that I've coloured one of the newer style High Hopes images and I have to say, I really enjoyed myself! I got my shading a bit wrong (light would never be hitting some of those angles!) but on the whole, lots of fun was had. The colours also tied in perfectly to these delish My Minds Eye papers.... scrummy! Stamps: 'Sir Dustin' by High Hopes, available HERE from DTDF. Paper: 'So Sophie - Savvy' by MME, available HERE from DTDF. Copic Markers: E00, E11, E29, E31, E33, E35, E37, E50, R35, R37, R59, YG03, YG63, YG67, W1, W3, W5, W7, C1, C3, C5, C7 - available HERE from DTDF. Tools & Embellishments: Cheeky Clip and buttons from stash. 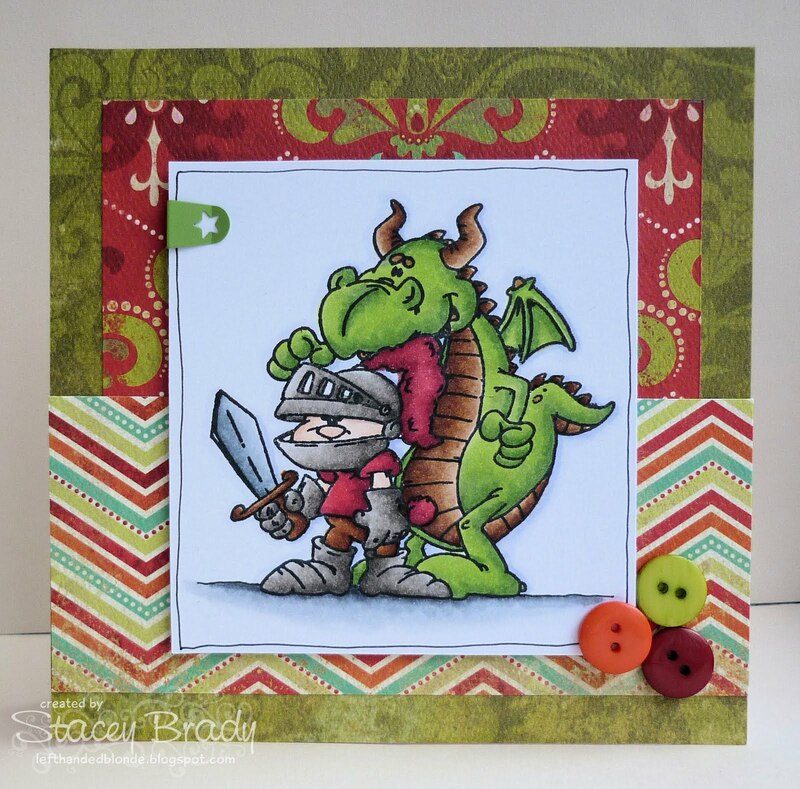 I'm going to enter this little card in to the challenge over at Stamp with Fun (Card for Boy/Men) and also Secret Crafter Saturday Challenge (Fairytales). I think it's also eligible for this weeks Charisma Cardz challenge as I'm pretty sure that dragon has a tail! OK, better go and do some work I suppose. Such a shame as I'd much rather be crafting! Brilliant card Stacey...love the papers and your colouring is perfect! Great card. I saw this adorable dragon and just had to click and see it bigger at Charisma Cards. Love your coloring!! There's some great dragon sentiments over at Creative TLC you might like. Stacey this is awesome, love the colours and funky layout! Stacey this is FANTASTIC, I LOVE these images and your coloring is AWESOME!!!! What a great card girl! Girl I have such a hard time when coloring thinking about where the light hits etc!LOL!! I think this turned out cute!! Your coloring looks great to me. Adorable card, love that image! Fab boys card Stacey. Love the colouring, nothing wrong with it to me, looks pefect! Very great card! I like it! So many great details! Thanks for joining stamp with Fun. Love the card Stacey! Love the colouring you did! So gorgeous boy card,I love the image and the wonderful papers.thanks for joining in our challenge. I wouldn't worry too much about the angles to be honest - it looks superb as it is. Have just finished and posted my Charisma Cardz Project for the Something with a Tail Challenge and now having a look around to see what others have done. Thanks for showing your work and letting me visit.